The top Democrat on a key Senate oversight committee said she fears not enough has been done to reduce the use of noncompetitive contracts by the Federal Emergency Management Agency ahead of the 2018 hurricane season. Last year, FEMA came under scrutiny after a number of companies tapped to help with disaster relief during an unusually costly hurricane season were revealed to be ill-equipped to carry out their contracts, exposing weaknesses in the agency’s overall contracting process. 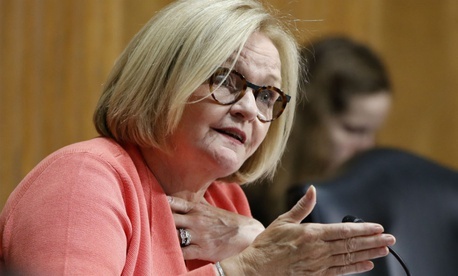 In April, Sen. Claire McCaskill, D-Mo., asked FEMA Administrator Brock Long for more information about the award of noncompetitive contracts, as well as for a plan to increase the use of prepositioned contracts, where companies apply to help with disaster recovery in advance, and are on standby for when FEMA needs them. In a letter to Long on Thursday, McCaskill said she was “pleased” to see FEMA award 27 new prepositioned contracts in recent months. But she said she remains concerned that the agency has not improved its vetting of contracts enough, especially as the Category 4 Hurricane Lane approaches Hawaii. According to information from FEMA, the agency awarded 355 non-competitive contracts in response to three major hurricanes in 2017. But it said there is “no mechanism readily available” to track which of those contracts exceeded the 150 day-limit for non-competitive awards. FEMA’s struggles with tracking noncompetitive contracts are not a new phenomenon. The Government Accountability Office found in 2015 that more than half of noncompetitive disaster relief contracts that it reviewed exceeded the 150-day time limit, and lacked the required justification from the FEMA head of contracting activity. McCaskill demanded Long provide information about how FEMA decides to issue a noncompetitive contract, as well as what steps the agency takes to ensure those contracts do not exceed the 150-day time limit. She also asked for an update on the status of the 355 noncompetitive contracts awarded after the last hurricane season, as well as data on how many of those contracts exceeded the time limit. FEMA did not immediately respond to a request for comment on McCaskill's most recent letter.